transforming our despair and apathy into constructive collaborative action. 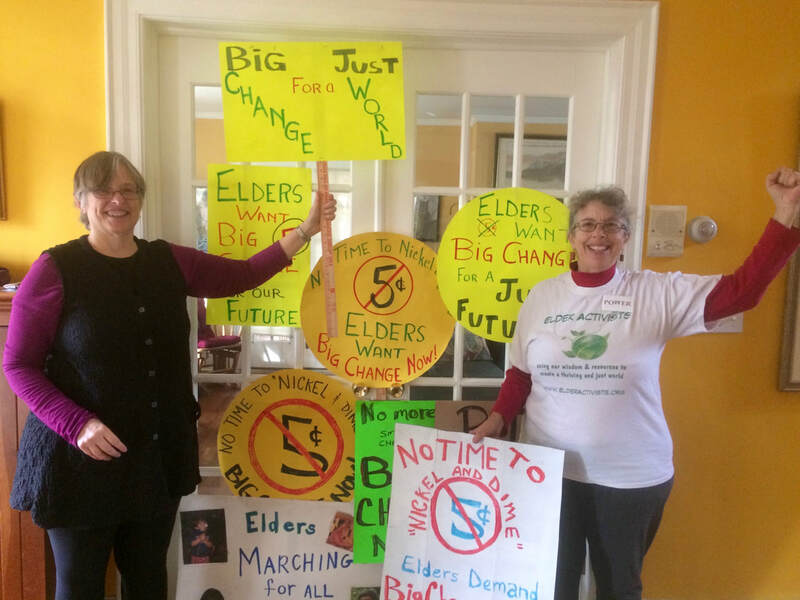 Elder Activists is a vision -- of individuals who use their life experiences, reflections and wisdom to inspire, educate and support each other in creating the future that will be our legacy. The INVITATION is for you to join this effort – working together with so many other people of all generations for a vision that is bigger than any individual dream. Collective action is powerful – especially when going against powerful interests. “It would be entirely fitting if the angry troublemakers came from the ranks of those of us who are older. For one thing, we’re the ones who caused the problem. If someone has to sit down on the tracks of the coal train and get arrested it should be the grandparents who have been pouring carbon into the atmosphere for half a century. …. But there’s something else, too: the greatest moments in the lives of the baby boomers were precisely the times when they raised their voices, when they declared their selfless devotion to peace or civil rights. For too many, the decades that followed have made a quiet mockery of that earlier idealism. It turns out that we’ve excelled, most of all, at consuming. Now is the boomer’s chance to reclaim their better natures and to end their run as they began.” - Bill McKibben, The Last Best Chance for the Boomers” (available in The Bill McKibben Reader: Pieces from an Active Life).